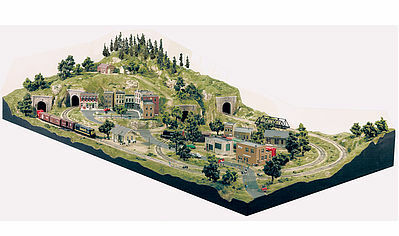 The Grand Valley is a Complete 4x8-foot HO Scale Layout Kit that you build from Woodland Scenics. Retail $599.99 SAVE 25% ! Want to start your HO model train life? This layout and set are the best for you. Requires no expensive power tools to build. No dusty mess to clean up. Full-scale track plan printed on base. -Install risers and inclines on printed base. -Cut profile boards and install. -Add roads and begin landscaping. -Finish with trees and foliage. Modelers at any experience level will feel like an expert craftsman after building the Grand Valley HO layout. It can be a stand-alone layout, or it can be customized to be part of a larger layout. The City & Industrial Building Set (WOOU0486) looks great on it! Each building kit is individually packaged with its own assembly instructions.